My dealer outside of Philly- Cycles BiKyle has been selling the Impulso road bike for many years. They're familiar with the technology surrounding the frame and fork. They've taken test rides in the alleyway on the bikes after building them up in the shop. They tout the benefits to their customers of how strong Triple Hydroform Technology makes the front end of the Impulso frame and how K-VID reduces the level of vibrations entering the front end of this Endurance Race bike. **All of this is translates to merely a Bianchi sticker on the shop employee's arm. However, getting a shop on the bikes for a 2-hour ride... now that's putting the ink on the needle and getting it under their skin as a tattoo. Alex and Nolan are the shop managers at Cycles BiKyle. They've done a great job growing their numbers with Bianchi. Something worth noting is that they're a Pinarello dealer too. However, they are seeing Bianchi sales pass the Pina brand! Their Pennsylvania shop is near Rodale publishing who prints Bicycling Magazine. As we all know, Pinarello been an ad-player in that 'zine for 10+ years. Even with that sort of muscle, to have Bianchi pass them in sales in this prestigious shop speaks volumes for relationship building. And for that I'm grateful. This year Nolan just started road racing on his Oltre XR.1. Alex aside from doing 150 miles/week on his 928 SL rides fixed gear and BMX street/park. With these two riding styles, I put together a ride to suit them and showcase the versatility of the new Impulso All Road bikes. The route we took on Sunday covered many sleepy and winding farmland roads in Amish-land. Within the first two miles of my house, we crossed an old covered bridge that's the longest in Lancaster County. Sitting in at 180 years old it's since been renovated yet retains all the charm of wood and Amish as you could imagine. The exit of the bridge drops down steeply in elevation and has wreaked havoc on many a tall truck when exiting it; tilting the tail of the box up high enough that one time a tractor-trailer got wedged up against the roof, closing it for weeks for repair. None the less, this drop at the exit is a blast if you hit it hard and fast. Being Sunday with no traffic, the three of us rolled into the covered bridge at full speed! Leading the guys and knowing their unfamiliarity of the exit, I hit the lip of the exit, pulled up on the All Road bars and got air with a bit of a moto-whip of the tail end of the bike, touching down on the downside of the bridge exit. Alex and Nolan hooted and hollered as they jumped out of the bridge as well. This set the tone for the rest of the ride- go hard, fast, ride unapologetically. We snaked our way for the next few miles over public roads and greenways. We linked up to a park which has some mountain bike singletrack. I love this place. And have been riding it for years in the fall on the cyclocross bike when I need to tune up my bike-driving skills for race season. A string of 2x8 planks leading off the greenway kept us above a marshy section of the trail. We then hopped onto a 20' long footbridge to cross a creek, and finally into the woods. The Impulso All Road's cassette is geared low. 12-32t on the Shimano 105 bike and 12-34t on the Tiagra version. In low range, we pedaled our way up the ribbon of trail. Young and ambitious, Alex and Nolan pinned it to keep up with me on the singletrack; flowing, carving, pumping around the occasional protruding root section. Running my bike tubeless with upgraded 40mm Kenda Flintridge tires lends my riding to a bit of devil-may-care style. At least I baby powdered Alex and Nolans bike tubes when initially building up the demo bikes. This seemed to ward off any pinch flats throughout the course of our day. After the cheers and jeers of the trails, we made our way north in the county towards the Lititz Airport. There's a road loop that circles the airstrip. It's a wide-open stretch, such that it's become a popular Strava segment for riders on TT bikes and others doing threshold work. Intersected with a roundabout, the road also has a gravel access road that parallels it. Nolan spots the access road and makes a beeline out of our paceline, straight over the shoulder of the road, through the grass and onto the gravel access road. Alex comments ranged from how surprisingly fast you an roll on flat roads with the 35mm Kenda Flintridge tires and how quick and agile the Impulso All Road rides despite its chunky tire appearance. Soon enough Alex peels off my rear wheel and joins in the chase to Nolan. At one point a paved driveway intersects their gravel access road. Alex eyes up the slight rise in elevation and pedals harder, hell-bent for leather....jumps the lip and almost airs over the width of the driveway. At that moment I wish I had a Go-Pro camera. For the next dozen miles or so we play 'left turn, right turn' heading north in the county towards Ephrata. I turned our route east onto Lime Rock Road (above video). It's full-length gravel. This gave the guys a few minutes to test out the stability of the Impulso All Road. The chainstays on the new All Road bikes are 30 mm longer than the Impulso road bike. This extra length out the back combined with a wider tire creates better stability at full speed across loose surfaces. The stock Impulso All Road wheelset is Tubeless Ready which I highly recommend upgrading to tubeless tires. It's a ride quality you can discern. Making our way south back towards my house, we hit the last gravel road sector- Crooked Lane. This slices a working farm, in half. We spin our way past resting tractors (Amish and Mennonite do not work on Sundays). A marmalade cat scrambles for cover, spooked at the sight of us as we make a hard left turn to climb up towards the newly harvested corn fields. With 30 minutes left in the ride, we're starting to feel the miles creep into our legs. 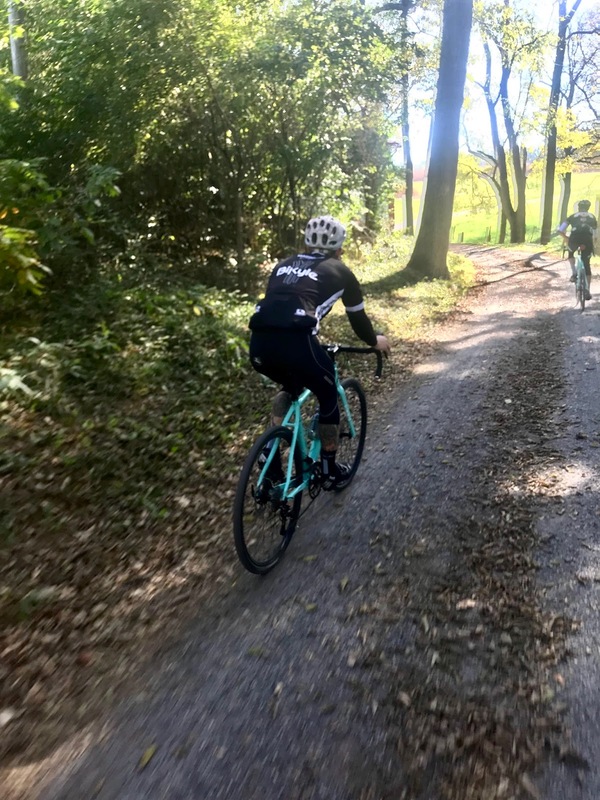 All the surging, on and off the gas, chasing each other, pushing the larger tires down the road, the 40-mile ride was starting to feel more like 55 miles. And truthfully, that's the terrific thing about a bike like the Impulso All Road. Unless you're doing a group road ride where you're averaging 18-20 mph for 3 hours, riding an All Road bike for a couple of hours gives you one hell of a workout. In the past, I've shown up to many a C-pace ride running 35mm file tread tires, averaged 16mph on the ride with everyone, and managed to open up some exciting dialog with riders. Typically the conversation goes as- a.) riders can't believe I'm keeping up with them on 'chubby tires'; as one woman in Rome, GA said to me with her thick southern accent. And b.) riders can subscribe to the idea of having one bike that you can do a century ride. Or throw on 35mm tires and ride the gravel rail trails or knobby tires if you want to go cruise some flowy mountain trails. The Cycles BiKyle guys are super stoked on the Impulso All Road bikes.